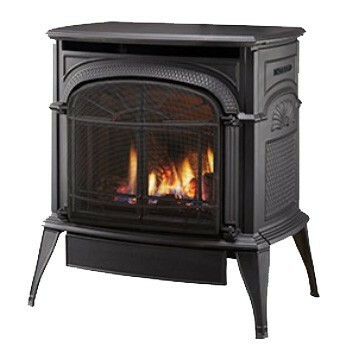 FREESTANDING GAS STOVES mimic their wood burning counterparts but offer the convenience of gas: easy venting solutions for installation nearly anywhere, thermostatically controlled fires plus a variety of sizes, colors, and designs to suit any room. 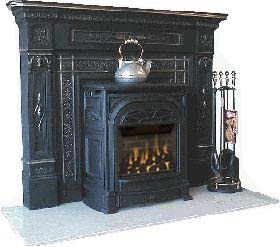 Specialty lines with historic styling are exactly what you've been looking for! Direct Vent models offer the greatest efficiency of all vented appliances, and the most versatility in installation due to the option of horizontal or vertical venting. Vent pipe may terminate through a wall or through the roof. A double wall vent pipe is used; one chamber provides outdoor air for combustion while the other provides a passageway to exhaust the fumes; this system balances incoming combustion air with outgoing exhaust air for a "balanced" operation. Direct vent models are the most efficient; they do not remove heated room air to provide combustion for the fire; their performance is not generally affected by home construction issues and they most often work perfectly in all installations.